Apple Brandy is new from niche line By Kilian. It's exclusive to the brand's boutique in New York City (boo! hiss! we hate localized perfume exclusives!) and according to brand founder Kilian Hennessy, is meant as a "bit of a wink to the Big Apple and cognac". And hey, that's just what it is, so much so that this will be a shorter review than usual. Apple Brandy opens as a fruity rum cocktail, liberally garnished with apple slices. It warms quickly, taking on heavier oak and amber notes. Within a few minutes, it's closer to something you might reasonably call brandy, and the apple garnish, meanwhile, evolves into something more like baked apple with a caramelized sugar topping. The sweet notes are lightly done, mind you, and much less assertive than the wood notes, so it never gets overwhelmingly gourmand. The longer it's on skin, the drier and oak-ier it gets, but it never quite reaches Serge Lutens Chêne levels of oak-ness, and it's mostly linear after about 45 minutes. Verdict: great fun, and a nice concept for a boutique exclusive if you have to do such a thing (they're also doing vodka for Moscow). Since great fun is often exactly what I find lacking from the Kilian line, I was very happy to try it and I enjoyed wearing it immensely — it's a perfect for a snowy January. Do I need a bottle? Well, no. For one thing, I've already got a bottle of Chêne to cover my booze + oak barrel needs, for another, hey, it's $235. It's not that fun. Do comment with your favorite boozy fragrance, if you have one! By Kilian Apple Brandy is $235 for 50 ml Eau de Parfum, refillable, in the usual Kilian box with lock and key. Apple Brandy was developed by perfumer Sidonie Lancesseur; notes feature alcohol sugar, an apple, rum and plum accord, smoke and oak barrel accords, cedar, labdanum, ambroxan and vanilla. I am pretty sure it was available for sale on the Kilian website recently (anyone know?) but it currently shows there as "not available". 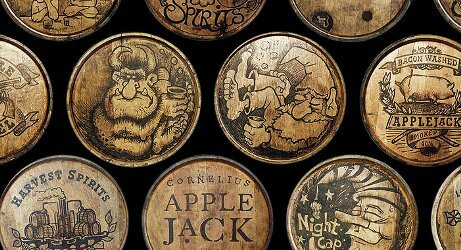 Note: top image shows decorated oak barrels at Harvest Spirits Farm Distillery and is via their website; they are the makers of Cornelius Applejack. Although I guess there is some irony in comparing a perfume supposedly inspired by exotic locations to one inspired by New York City! Hey, it’s not like NYC is the birthplace of brandy anyway, right? Yeah, and it seems like the ‘rum’ note here is supposed to suggest brandy, cosiness and cheer, whereas I think Idole’s rum is supposed to suggest drunken sailors, lol! And it works, I guess — Idole is by far the more exotic of the 2. People keep bringing up NdN lately, I need to try it again. I am glad they did not go the spice route, there are already enough spicy booze scents, and almost-apple-pie scents too for that matter. My current signature boozy fragrance is another By Kilian, Straight To Heaven. I should try that one again — it’s by Sidonie Lancesseur too. Not sure if I tried that one or not…I have fallen way behind on the Bonds! But I see that one was cognac too. I love Frapin’s 1270. The boozy, fruity notes really makes me think of a party! Their 1697 is boozy too, and since smelling that one I have trouble keeping the two straight in my mind. I know I liked one better than the other, but don’t know which! Great scent! Parfums DelRae for anyone who wants to know. The boozy one that springs to mind is Hedonist. A bit peachy for my taste, but I can definitely see how it has its fans. Havana Vanille (now Vanille Absolument, right?) is my favorite boozy – it’s not one of my favorite notes, but it’s pretty good in that. Nice to hear there’s a “fun” Kilian. Fun being relative at that price rang,e of course. Yes, and wish they hadn’t renamed it. Liked it better as Havana Vanille. I am admittedly not a Kilian fan-girl; I find the line mostly humorless. I liked the florals from the original line, like Beyond Love and Sweet Redemption, and I liked Rose Oud enough to scrounge several samples. Other than that – ehhh. I think I’m put off by the LLLLLLUXury angle. It’s seriously off-putting. But I do think I’d get over it if I liked a bigger % of the products. So far, really only like a few. Interesting! Where did you find the scents? A friend in another city told me that their branch of a local department store was stocking some new brands including Korres. So, I went to the branch on my side asking whether they would be getting it as well. As usual, no one knew anything – but one SA overheard and mentioned this brand Kings & Queens, saying that it was actually a Korres line. So, of course I went to check it out:) Mostly its shower gels and creams (apparently very nice, according to reviewers) but my focus was on the EDTs. Thanks! Seems to me I’ve seen it somewhere but can’t think of where. Korres is a greek brand started as a pharmacy then expanded to natural body care/fragrance products. I used to see King & Queens (shower gels) in the Duane Reade drug store chain but it’s been a while since I’ve noticed it there. Lately, my favorite boozy perfume is Cartier Baiser Vole Essence. The cognac note is oh so smooth! Gosh, I forgot to comment about Apple Brandy! Methinks a field trip to the By Kilian boutique is in order. I’ve wanted to check out that snake motif travel spray, assuming that it is still in stock. Pretty sure it is, I think I just saw another magazine article about it. Oh yeah, good to know! Interesting, it does not smell like booze to me at all! Dessert, yes, but not booze. It’s way boozier on my sister than on me so I would think that skin chemistry makes a difference. Boozy: Bentley Intense. Actually my SOTD. The rum note in it makes it fairly close to Lubin’s Idole. Another good liquor type scent is D’Orsay’s Le Dandy (though I haven’t tried the reformulation) – kind of a spiced apples and brandy vibe. Hey, then I should try the Bentley! Guerlain’s Spiriteuse Double Vanille is my favorite boozy perfume. And even though it’s just as expensive as the By Killian, it is that fun! Gosh, is it that spendy? I’d forgotten. And they don’t even put it in the nice bottle anymore. Apple Brandy sounds right up my alley, but not for that price. I’ve already got my perfect boozy scent in Opus Oils M’eau Joe #3. My absolute holy grail scent. And that’s one’s a bargain! Probably never gonna try this, being that it’s 3000 miles away. :-/ The only alcohol I buy (unless I’m hosting a party for friends who drink) is pear brandy for Christmas fruitcake. I like the way it smells, but not sure it’s occurred to me to smell like it! I feel like Amouage Memoir has something wine-y about it. And several of the Serge Lutens have that boozy, stewed fruit thing going for them. I love Frapin 1697 (the Duchaufour). It’s like the best ever spicy creme brulee with cognac. Not a million miles from Duchaufour’s L’AP Havana Vanille/Vanille Absolument, but far richer and more delicious. A perfume for luxuriating on furs in front of a huge hearth in a mountain lodge in January. Thanks! I think that was the Frapin I liked, sounds right. All of my favorites have been mentioned except for Le Labo Oud 27 which has an incredibly strong whisky note on me. Never heard anyone else mention this aspect but it smells more of whisky than oud on me.